Rutherford's father was a wheelwright, who had emigrated from Great Britain. Ernest, the fourth of the 12 children, was born in New Zealand. He obtained a scholarship to attend secondary school and another to enrol in Canterbury College, Christchurch. He graduated with a B.A. in 1892 and an M.A. with first-class honours in mathematics and physics in 1893. Part-time teaching enabled Rutherford to pursue research at the college. He published results from his studies of the properties of iron in high-frequency alternating magnetic fields and won another scholarship, which enabled him to go to Cambridge in England in 1895 He continued the work begun in New Zealand, where he had already discovered that electromagnetic waves could pass through brick walls, and extended the experiment over a distance of over 3 km. In the same year Röntgen had discovered X rays, and together with Joseph John Thomson, professor of experimental physics, Rutherford began to study of the effects of passing a beam of X rays through a gas. They discovered that the X rays ionized the atoms, producing large quantities of electrically charged particles, which recombined to form neutral molecules. Rutherford measured the velocity and rate of recombination of the positive and negative ions and published the result in a classical paper. In 1896 Henri Becquerel discovered that uranium emitted rays. When Rutherford studied this he noticed two distinct types of radiation which he named alpha rays and beta rays. In 1898 Rutherford was appointed to the chair of physics at McGill University in Montreal. He stayed for seven years and returned to England in 1907 to accept a chair at the University of Manchester. In 1919 he became Cavendish Professor of Physics at Cambridge University, where he stayed for the remainder of his career. Rutherford's work established an entirely new branch of physics called radioactivity. He and the chemist Frederick Soddy investigated radium, thorium, and actinium and concluded in 1902 that radioactivity was a process in which atoms of one element spontaneously disintegrated into atoms of an entirely different element, which also remained radioactive. The idea that atoms could disintegrate to form new elements went against all basic beliefs in chemistry; Mendeleyev, the discoverer of the periodic table, did not accept it until he died. Rutherford's work thus created strong opposition, but the Royal Society elected him a fellow in 1903 and awarded him the Rumford medal in 1904. In 1903 Rutherford showed that alpha rays can be deflected by electric and magnetic fields, the direction of the deflection proving that the rays are particles of positive charge. After his research assistant Hans Geiger invented the Geiger counter, Rutherford and Geiger counted the particles as they were emitted one by one from a known amount of radium and measured the total charge collected, from which the charge on each particle could be detected. From this Rutherford was able to deduce the number of molecules in the molecular weight in grams of any substance, known as Avogadro's number, in the most direct manner conceivable. 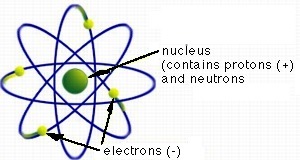 In 1908 he and his student Thomas D. Royds showed that the alpha particle is a helium atom. 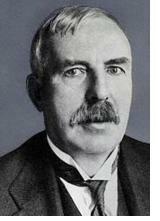 In the same year Rutherford received the Nobel Prize for chemistry. Rutherford's greatest impact on the development of science came with his nuclear theory of the atom. From the diffraction of particle paths during collisions he had concluded that all the positive charge of an atom and nearly all mass is contained in a very small nucleus some 10,000 times smaller in diameter than that of the entire atom. His model of an atom looked similar to a solar system, with electrons circling the nucleus on prescribed paths. The Japanese scientist Hantaro Nagaoka had developed a similar model six years before Rutherford, but because it went against the teachings of classical electrodynamics it had not been taken seriously. Rutherford supported the idea with more observations and theoretical calculations. Although his model remained "state of the art" for only three years (until Niels Bohr modified it by postulating in 1913 that electrons could only circle the nucleus on certain paths but could change from one path to another) it is regarded as the foundation of nuclear physics. During World War I Rutherford worked on submarine detection by underwater acoustics. Later he served as president of the Royal Society (1925-30) and as chairman of the Academic Assistance Council, which helped almost 1,000 university refugees from Germany. He was buried in Westminster Abbey in London. Allibone, T. E. (1995) Ernest Rutherford, Encyclopaedia Britannica 15th ed.